The Los Angeles based painter Alfredo de Batuc asked me to make a short video illustrating his work in a particular sketchbook which, following a debilitating encounter with Guillain-Barré syndrome, marked his return to art-making. The results, “Bosquejario I,” the title being Alfredo’s imaginative way of saying “Sketchery – One.” I used a consumer level Canon VIXIA Camcorder, and a Sony DSLR to photograph the entire shoot. “Bosquejario I,” was an Official Selection of the East Los Angeles Film Festival, 2016, and was premiered at Raleigh Studios, Charlie Chaplin Theatre, Hollywood. After the principal photography was completed – how to proceed? To help get my mind around this project – how to order the images, how to tell the story – I decided to start with real thumbnail sketches and a storyboard. On my dining room table, Alfredo and I loosely grouped all of the images by theme. One group I wanted to present in a ‘grid’, another group, a standard carousel slide show, and so forth. At this stage some images were selected as ‘featured’; and would be highlighted in detail. With all the themes and groups identified, I decided their order of display and marked each packet 1-16 respectively. Thumbnail sketch of ‘grid’ sequence. Camera work. Starting with thumbnail sketches. Grouping images for a storyboard. The “index cards” of our storyboard. 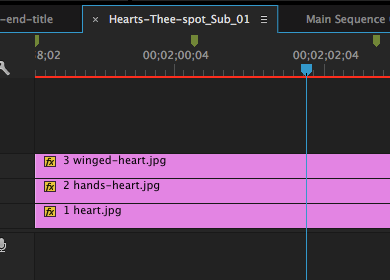 Before importing the media into my Premiere Pro project, I made bins for each of the 16 slide groups, numbered and titled each bin, and filled the bins with jpeg’s, or, Photoshop Documents (PSD’s), themselves ordered by number. These numbered bins, and files, when imported will be automatically in order, and a tidy project bin is dear to productivity when dealing with more than one hundred images. Layered PSD’s can be imported as sequences – another time saver. 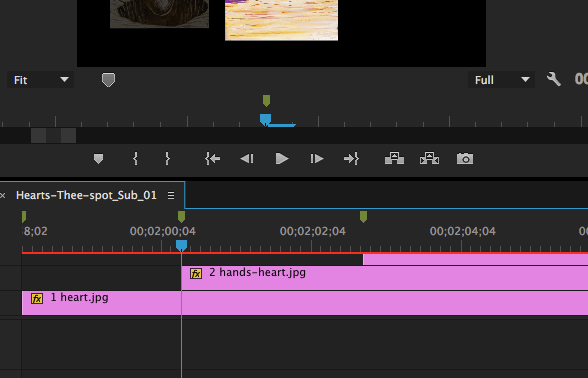 The project bin in Premiere Pro. Once images and sequences were in the time-line, now I needed music for the project. After a lot of listening, Alfredo and I settled on a keyboard composition by Kai Engle which we found at the Free Music Archive (bless their socks). In one sequence, dubbed a ‘three-spot,’ three images pop into view one at a time. The “three-spot” sequence on the main timeline. Returning to the main timeline, I hit keystroke “L” to play over the three-spot sequence. Listening carefully as the playhead moves over the three-spot sequence, I tap keystroke “M” to lay a marker in the place where I want a new image o appear. Markers in place, I double-click on the sequence to edit its layers to the markers. This process was repeated for each sequence, throughout the entire project. Green markers guide the edits. This gif was made from an .mp4 imported into Photoshop. Here is a gif made to work well with Twitter. More about Alfredo de Batuc at his website. I hope you’ve enjoyed this examination of the making of “Bosquejario I.” It’s been a real joy exploring again this happy project.